Its closest ancestor would be the nautilus, the octopus, the squid and the cuttlefish. The first specimens appear during the Devonian period (about 415 million years ago). They disappear during the cretaceous Paleocene, such as the dinosaurs (about 65 million years ago). Their species is a good chronology data because of their evolution. It allows dating the layers on which they are discovered. 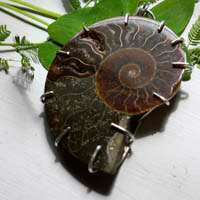 Ammonites can be from a few millimeters to more than a 2 meter diameter. Their name comes from their spiral shape that is referring to the horns of the ram. Pline the Old would call them "the horns of Ammon". He was referring to the Egyptian god Amon who was represented with ram horns. Until the middle of the 18th century, the real origin of ammonites is unknown. Therefore, there are several legends about it. According to the Greek belief, you had to put an ammonite under your pillow to avoid insomnia. Greeks used to call it ophites. Maybe it was due to the belief that it would prevent from losing sight, impotence and snake bites. During the Middle-Ages in Europe, it was thought that the ammonite was a petrified coiled snake. In England, it was often called Snakestone. In this same country, it was thought that it was a proof of a miracle like the ones of Hilda of Whitby and Saint Patrick. In Whitby (England), you can easily find this fossil. According to the local legend, Saint Hilda (614-680) would have got rid of snakes in her monastery by cutting their heads. This obliged them to coil themselves in spirals and transformed them into stones. Therefore, these fossils had curing powers or could give oracles visions. Magicians thought that putting an ammonite under their pillow would give them divine visions. There is a whole business of relics on which one would paint or sculpt a snake head on ammonites to sell them. In some parts of Germany, ammonites were called Stone dragons and were used to fight against fate. For example, if a cow could not produce milk, one had to put an ammonite in the milk to protect her. In China, ammonites were seen as horns and were called Jiao-Shih, or Stone horn. For Hindus, ammonite was a manifestation of the god Vishnu, more particularly for the ones that were found in the Gandaki River in Nepal. They were known as shaligrams. In Australia, aborigines would think that ammonites had magical powers and would wear them as amulets. The Blackfoot Indians in the USA would link the ammonite to the position of the buffalo when it was sleeping. They would therefore call it the buffalo stone or Iniskims. They would use it in rituals before hunting. They also thought that finding an ammonite before a long journey was a good sign. For Navajos, ammonite was called wanisugna. It would mean "the life in the seed, the seed in the pod" and was used by medicine men. Ammonite would help while giving birth, and more particularly it would help reduce pain. It would increase vitality and endurance. It would help resolving ear, lungs, digestion and blood pressure problems.